Home News Editorial Cloutierville students no long bussed; also, Milo is here! Cloutierville students no long bussed; also, Milo is here! The School Board voted on major changes that will greatly impact bussing of students during the board meeting Thursday. The first change is that 83 students who live in the Cloutierville area and have been bussed to Provencal will attend Cloutierville Elem/Jr. High when school starts in the fall. Also, students who live on Fairgrounds Road, Airport Road, Fish Hatchery Road South Town, will no longer be bussed to Cloutierville. They will attend City schools next school year. The changes will result in much shorter bus rides to and from school and should significantly reduce transportation costs for the school board. Since the federal court granted unitary status to the school system in 2017, the administration can re-establish attendance zones to replace those established in the early 1980s to achieve racial equality. “Milo is here,” Director of Special Education Toni Bennett told members of the school board at their committee meeting Tuesday. 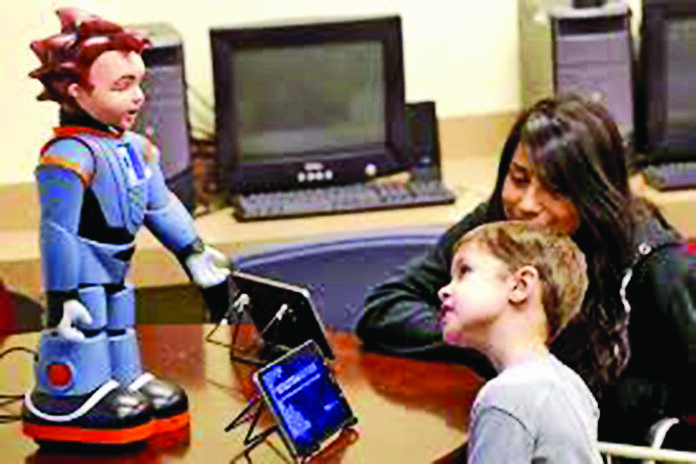 Milo is an expressive humanoid robot that engages students with Autism Spectrum Disorder to help them learn social, emotional behavior and communication skills. The special education department now has three of the robots thanks to an anonymous donor who covered the $30,000 cost. That includes the expense for at least three years and will pay for the robots, cases, training and curriculum. Training on use of the robots will begin at the end of May and staff will have the summer to get acquainted with Milo. Bennett said the Milos will be the first to be used in Louisiana and the manufacturer wants to promote their use in Natchitoches Parish nationwide. According to Milos.Robots4autism, the curriculum has over 130 lessons pertaining to emotional, conversational, situational and calm down areas. It has a full range of facial expressions allowing him to model emotions. As he speaks, symbols are displayed on his chest screen that will help students better understand what he is saying. Supervisor of Finance Richard Foshee emphasized that Milo will come at no cost to the school board. There was little other business on the agenda. At the regular meeting Thursday, the board accepted the bid of Stephens Contractor for $123,570 to upgrade HVAC and electrical at Goldonna. The board voted to put bond renewal elections for Districts 6 and 7 on the December ballot since the next possible date for the election would be the governor’s race in the fall of 2019. Supt. Dale Skinner said he signed the contract with Echo Ride transportation that will starts July 1.